Whether you like him or not, and I do, Nigel Farage nails it once again in this clip from the European Parliament as he expounds on the dangers and failures of the EU—the look on the faces of German President Merkel and French President Holland are priceless. If Britain votes to exit the European Union, it will be voting to get rid of the 13,000-plus acts, rules, and regulations of the acquis communautaire, but otherwise to continue Britain’s economic relations with the Continent. 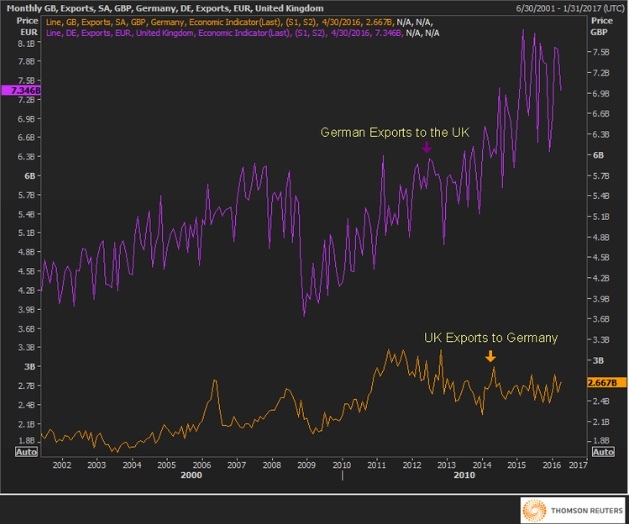 German Exports to the UK versus UK Exports to Germany Monthly: At current exchange rates (converting back to USD), the UK is effectively running a $4.4 billion dollar monthly trade deficit with Germany. Now I think you can better understand why Angela Merkel’s’ resident “hit man,” aka Finance Minister Wolfgang Shäuble, says it will be “poison” if the UK leaves. Is it any wonder why the UK trade deficit has done nothing but widen during its cozy nomenklatura relationship with the EU? UK Visible Trade Deficit Monthly in GBP from Jan 1996-April 2016: Gulp! Of course it is primarily the “little people” who feel this burden of real stuff. All those Eton grads are doing quite well in the “new” economy thank you! The guy in the middle, circled, is none other than Honorable PM David Cameron with his Eton pals. Not thinking many calluses on the hands of this bunch. 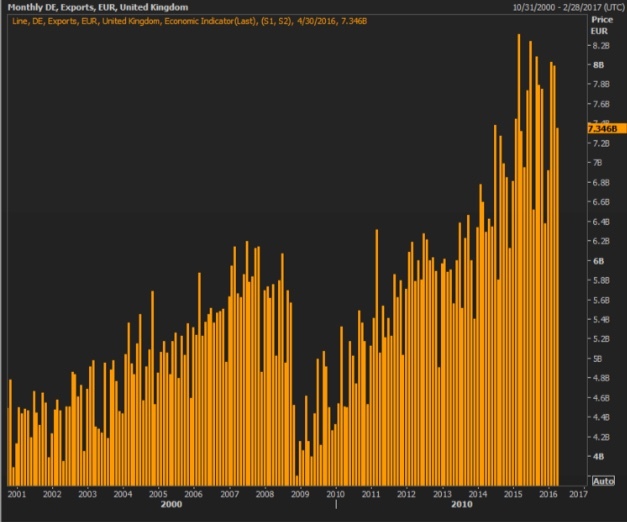 So maybe you believe the UK was just an unfortunate victim of the global rebalancing triggered by the credit crunch and the EU has actually softened the blow for the UK. Well, let me attempt to disabuse you of that notion by sharing the next chart of Germany’s monthly exports. “Holy towering BMWs Batman!” Is it any wonder why Germany loves the EU? 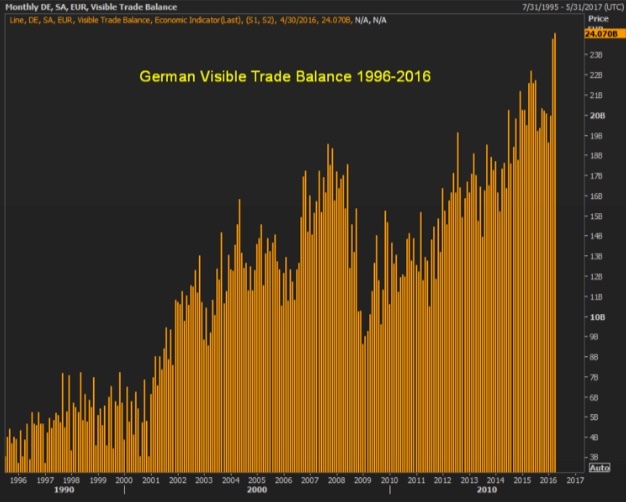 This tower of exports leads to a whopping balance of trade for Germany—a county by far more dependent on exports for GDP growth than any other in the world. “As German savings rose, eventually exceeding German investment by a wide margin, Germany had to export the difference, which its banks did largely by making loans into the rest of Europe, and especially those countries that were financially ‘shallower’. Declining consumption left Germany producing more goods and services than it could absorb domestically, and it exported excess production as the automatic corollary to its export of savings. 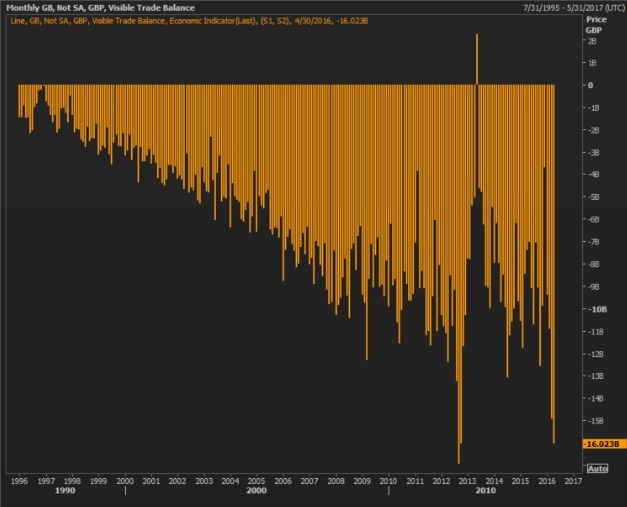 The chart of the German trade balance above may help you understand why some people question the veracity of German politicians when they tell us of their “sacrifice” for the EU. German taxpayers are no doubt sacrificing, but as Bernerd Connolly says, the nomenklatura isn’t sacrificing; its reaping. “If the European leadership chooses to preserve UKEU economic relations, they will be signaling to the other members of the European Union that it is not necessary to accept the comprehensive supranational overlordship of Brussels in order to enjoy the benefits of international economic integration and free trade. 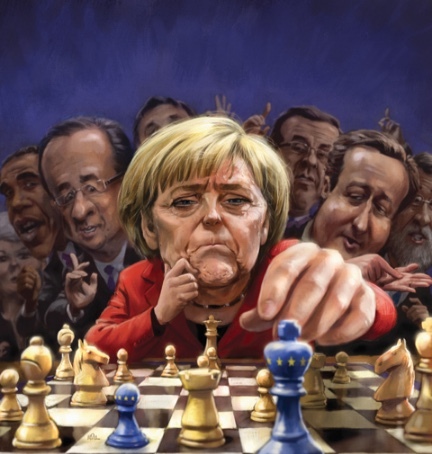 But if, in order to whip into line the remaining EU members, the leadership decides to destroy the hitherto beneficial UK-EU economic relations, the EU leaders will be signaling that their true institutional interest is not international economic integration but the political power of supranational governance arrayed against national sovereignty and the democratic institutions that underlie that sovereignty.